Morning all. 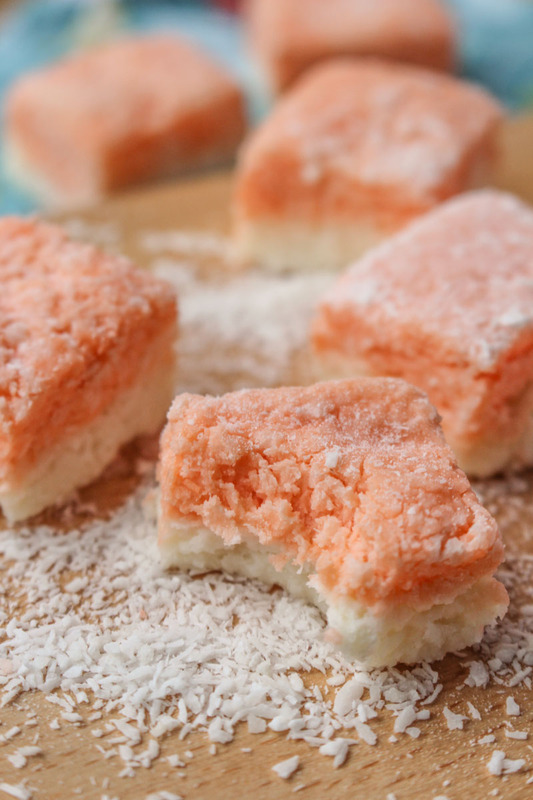 This is my ‘Valentine’s Day’ recipe – the ever-so unromantic Coconut Ice. I decided to make something pink, because pink = love, right? But then I went and coloured them peach. Top marks for me. I’m trying to rebuild my relationship with the peach food colouring I bought to make the peach disaster cake, ahead of our peach and gold wedding in June. It’s okay, I’m definitely back on the peach-train now. I love how cute these guys are. And I love a recipe that is impossible to mess up. There is absolutely nothing you can do that would make this recipe go wrong. If your New Year’s resolution was to cut down on sugar, but you are now ready to fall off the wagon, this is the perfect treat for you. 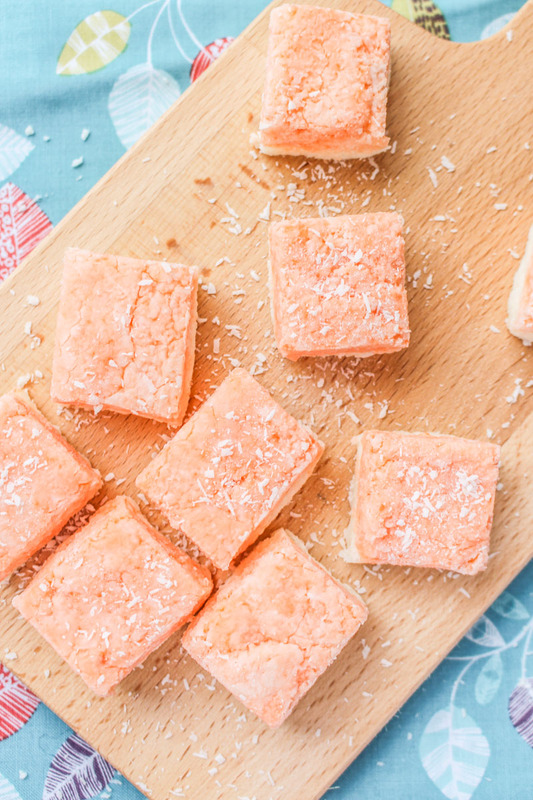 These little cubes are pretty much entirely sugar – oh yeah, and coconut of course. Coconut Ice is ridiculously easy to make. You don’t even need an electric mixer. Just a bowl, a spoon, and your own hands (which will inevitably end up covered in food colouring). Come to think of it, these would make great Valentine’s gift for your sweetheart. Or your friends, because who says Valentine’s has to just be about your other half? Or just make them for yourself and eat them all whilst watching Bridget Jones’ Diary, because that sounds like my idea of a perfect Valentine’s night in. Sweet and creamy coconut ice. Incredibly easy to make, these little cubes would make a fantastic gift this Valentine's Day. Line the bottom of a 20cm (8inch) square brownie tin with baking parchment or greaseproof paper. Put the condensed milk, icing sugar, and the vanilla extract into a large bowl, and mix well until fully combined. Add the dessicated coconut to the bowl, and mix well. The mixture will be very stiff, but this is normal. Press half the mixture into the bottom of the tin, making sure that there are no gaps and that the top is fairly level. Add some food colouring to the other half (pink is customary, but I used peach) and knead well with your hands until the colour is fully distributed. Add this mixture onto the top of the white layer already in the tin, and press down firmly. Make sure that the white layer is completely covered, and that the layer is even and level. Put the coconut ice into the fridge to set for a few hours, or overnight. Once firm, remove from the tin and cut into small squares (don't make them too big - this is very sweet). 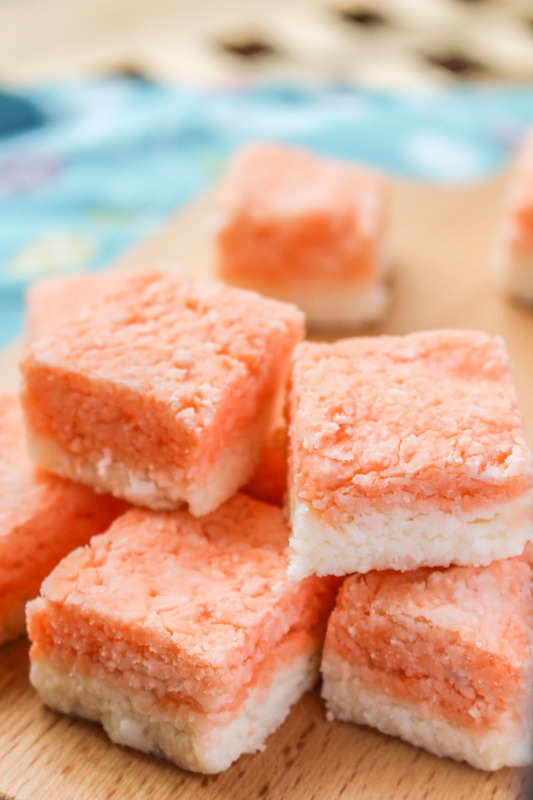 The coconut ice squares can be kept at room temperature for 2-3 weeks, if stored in an airtight container. The coconut ice can be frozen for up to 3 months, either cut up into squares or as a sheet.